Another week, another bourbon. 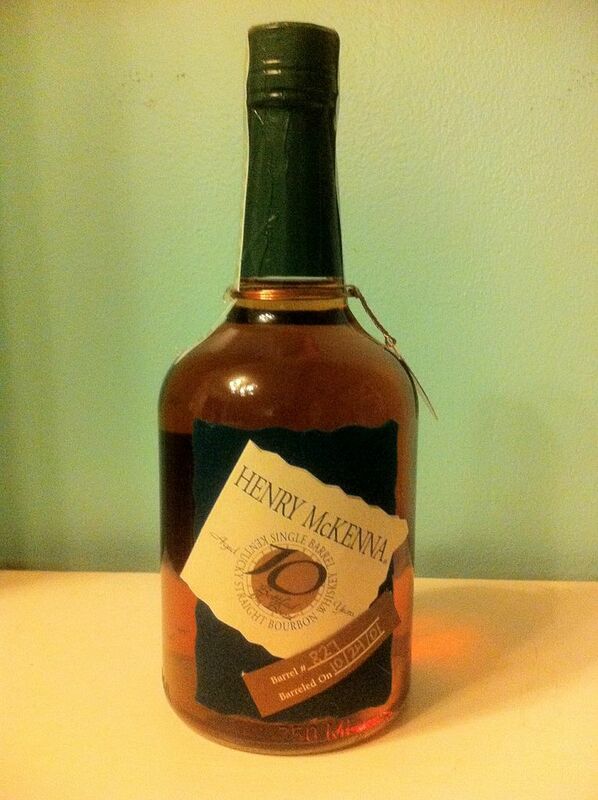 This time I am reviewing the bottle of 10 year old Henry McKenna I brought back from a recent trip to Louisville. I have tried this bourbon once before, in a flight at the Old Kentucky Bourbon Bar, and although I remember being impressed by the flight as a whole, I couldn’t remember how I had ranked it compared to the others so I was looking forward to opening the bottle and seeing how it stood on its own. Henry McKenna is put out by Heaven Hill Distillery in Bardstown, Kentucky, the same people who produce Elijah Craig and Evan Williams. The ten year has a really beautiful bottle, including a copper tag telling us it is bottled in bond. That means that it is the product of a single distilling, from a single distiller, has been aged in a certified warehouse, and is 100 proof. According to the website it is the only “extra aged” bottled in bond bourbon in production. It is what I would describe as an affordable top shelf product. The price varies but I paid about $30, which for a 10 year old bourbon is a fair price. It is also a single barrel bourbon, this particular bottle was originally barreled on October 24, 2001 and was barrel #827. The nose is light. It isn’t one that shows its proof in the nose, which makes the heat this bourbon packs more of a surprise. The smell was more woody than floral. I got notes of maple, cedar, and pine. When you take a sip you get a flash of sweetness on the tongue but the fire comes up quickly and nips it away. The sweetness is not caramel or vanilla but more maple and some light citrus. Don’t blink or you will miss it. Next comes more spiciness. There are notes of black pepper, cedar, but corn and rye make up the bulk of the flavor. Finally it finishes with a nice fire that warms you all the way down and hangs around for awhile after you’ve swallowed. After trying it neat I added a few drops of chilled water and it opened the bourbon up nicely. I was able to savor the sweetness for a little longer. Easing the fire allowed me to taste a little more complexity of flavor, especially in the finish. If you like heat and spice in your bourbon you will probably enjoy this, but do try it with a little water to see how it changes the flavor. It is also worth noting that because it is a single-barrel bourbon each bottle may have slight variations as well, so the next time I try it I could get a subtly different experience. The changeable nature of bourbon is one of the reasons I love it. Some drinks are like a paved road. The material and the view can vary but over all you will know what you are getting all the way through. Bourbon is more like an unpaved road. The flavor is bumpy and grit, rocks, and dust occasionally get kicked up in your face but it makes it all the more exciting. When it comes to the Henry McKenna 10 year, I usually like a little more time spent on the sweetness if I am going to have this much heat thrown at me, but I will still take it over a less exciting drink any day. You can hear Charlie and I trying this bourbon and giving our thoughts on Episode 65 of The Charlie Tonic Hour. Hey! I’m in Cincinnati as well, I’ve been thinking about getting a bottle of this for a while from the Party Source, I think this review has sent me over the edge (and river) to grab one this weekend! Cheers! been reading reviews for weeks, i have been on the brink of ordering, finally bought a bottle on line. should be here in a few days. im a big fan of elmer t lee, and jd single barrel, depending on my mood. cant wait to try this.